What has 88 keys but no locks? A piano! There is no shortage of jokes and funny stories when Simon Tedeschi is around. The world-class pianist arrived on stage at the Octagon theatre in pyjama pants and formal coattails, and it was clear his aptly titled children’s show Pianist and Prankster show was going to be a fabulous start to the Awesome Festival. The Awesome Festival opened on Friday at the University of Western Australia offering a bite-sized introduction to the children’s festival that will continue to unfold at the Perth Cultural Centre for the next fifteen days. The program includes more than 30 different dance, theatre, music and arts activities for children. Tedeschi has played for Luciano Pavarotti and the Queen but he also knows how to read kids and his show is a boisterous blend of classic piano repertoire and stories from his childhood. Mozart’s Twelve Variations in C was recognised with delight by my 5 year old – “It’s Twinkle Twinkle played really, really fast”. Other lesser-known pieces come with a story: Melinda’s Mini March is the piece that first inspired him to learn piano, and a Chopin Mazurka pays tribute to his Polish Grandmother. Tedeschi first performed at the opera house at age eight and has often been called a child prodigy. In this show he traces his precocious skills to his daily practice (often nine hours a day) and the family and teachers who supported him along the way: the principal who bought a grand piano so Tedeschi could practise at school and the classroom teacher who made a pile of cushions so he could sleep during class. “You know what I’m really bad at? Maths. And remembering things!” Cue a story about going to school with shorts on backwards. There’s a dreamy version of Schumann’s Traumerei, and Chopin’s One Minute Waltz, played ridiculously fast (in 35 seconds to be precise). And then, the finish (my seven year old’s favourite stunt), where Tedeschi lies on the piano stool and plays the piano upside down. It’s a revealing and also inspiring glimpse into the life of a person whose delight in music is incredibly contagious. Meanwhile, outside in the sun, the Octagon Theatre was surrounded with stalls and vendors creating a buzzing festival vibe. We tried a drumming session and enjoyed the frivolity of the El Presidente entourage, as bashful and delighted children were crowned and paraded around in a carriage. And we got caught up in the street theatre as the delightful Swiss dance duo Game Theory used chalk to literally draw bystanders into their game of hopscotch. Chalk dust went everywhere as the antics and dance moves unfolded around us. “Don’t worry mum, its organic and washable and bio-everything,” the dancers assured me. It was a fun introduction to the immense program of events about to explode at the Perth Cultural Centre. Awesome Festival has something for everyone and should definitely be on your holiday list. 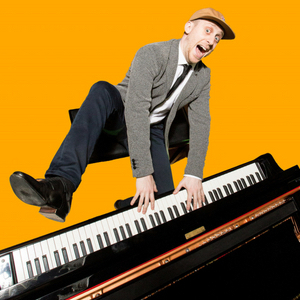 Pianist and Prankster plays the Octogon Theatre 29 September, 10.30am and 12.30pm. Awesome Festival runs until October 12, at Perth Cultural Centre, with opening events at UWA until September 29. Get the lowdown on the Awesome Festival from its Artistic Director Jenny Simpson. Pictured top: Swiss dance duo Game Theory, who will be playing Perth Cultural Centre next week, 2-7 October.